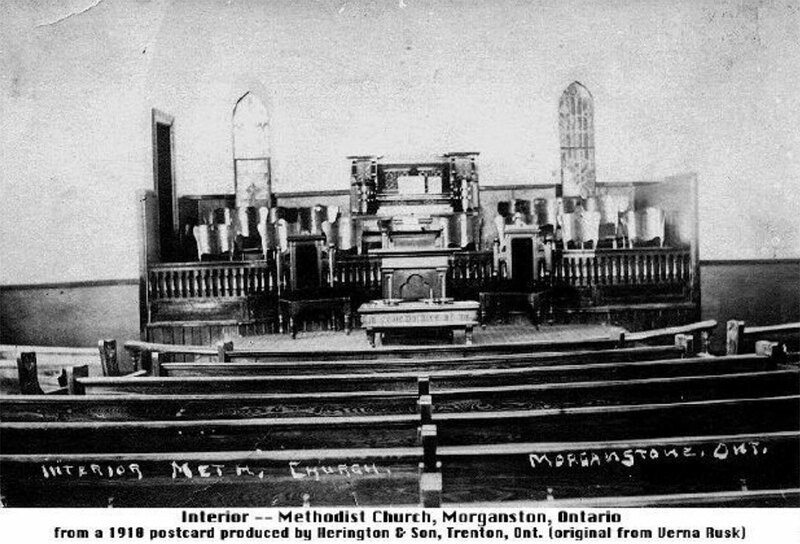 The story of Morganston United Church starts long before the erection of the present church building in 1910. In 1830, nearly a century before the church was built, Morganston was known as Snyders Comers, after William Snyder who built the first home there in 1833. Those early settlers held services in the Wesleyan Methodist Church on Lot 16, Con. 7, according to the Morganston history, “From Horses to Mopeds”. That church was erected on the farm of a man named Sabin, and so the faithful came to be known as Sabin’s Congregation. In 1865 a frame Methodist church, called Bethel, was erected west of Morganston. The building is still standing, but the structure has been greatly changed and enlarged as it was converted into a private home. In 1869, the name of Snyders Corners was changed to Morganston to honour the numerous and influential Morgan family. Rev. A. H. Foster was minister of the over-350- member charge in the early 20th century. The pastoral charge included Morganston, Oak Heights and Castleton. Between 1908-11 the trustees of Bethel made plans for a new church building. They purchased the present church property on County Road 25 from Marcus Wesley Massey for the sum of $40. The church building, says its history book, “was designed from structural lines of many other churches visited by Rev. Mr. Foster and church laymen”. The women of the church played an important part, according to the history: “A Methodist Ladies’ Aid was formed in 1907. These ladies were anxious to have a hand in the new church building, too. With raised eyebrows and some skepticism the men countered, “Show us $1,000 and we will do the rest.” Sure enough, three years later, the women turned over the $1,000 with the comment. “Now it’s your turn.” Through donations from the community and other Churches, the sum of $6,000 built a brick church in Morganston. The cornerstone was laid May 24, 1910. “The bricks(to build the church) were drawn from Colborne by horse and wagon, as were the (quarter-cut oak) pews and reed organ “ The new church was officially opened dedicated on October 30, 1910. The first wedding solemnized in the church was that of George Swaddling and Nellie Dennis on March 10, 1920. Mr. Swaddling’s father-in-law, Thomas Dennis, presented to the church Mr. Swaddling’s rendering of The Lord’s Prayer, the words carved without joints or breaks, from a single piece of wood. Records show enrolment of 112 in Sunday school in 1921, with an average attendance of 78 in seven classes. By 1923, enrolment had risen to 124. In 1925, the Methodists, Congregationalists and a majority of Presbyterians joined to form the United Church of Canada, and Morganston became a United Church. Throughout the succeeding years, the church and its congregations moved from strength to strength, forming a Literary Society in the 1920s, helping each other through the hungry Depression years and an influenza epidemic in the 1930s. Some of the church’s long serving position holders included: Lorne Darling (former treasurer of Cramahe Township) who was recording secretary from 1932 to 1964; Alex McComb, who was Sunday School superintendent for 30 years; Don Massey, Sunday school teacher for 38 years and Myrtle Hardy, organist and choir director for over 55 years. Between 1932 and 1972, the Young People’s Union varied between 30 and 46 members. And in 1958, the YPU changed its format to that of a mid-week congrega- tional meeting, in which the membership numbered 106. In 1969 there was a re-alignment that placed Morganston in the Percy pastoral charge, along with St. Paul’s Warkworth, where it remains today. Formerly, it had been part of the Castleton charge. In the 1970s, Morganston congregation members joined in the popular walk-a-thons, bike-a thons, starve-a- thons, swim-a-thons and dance-a thons prevalent at the time as fund-raisers. A once-thriving Hl-C club fell on hard times in the 1970s when many of the community’s young people left the area to pursue higher education, employment or marriage. But the church was still going strong, with an enrollment of 40 in Sunday school in the mid-’70s and an average attendance of 30. As with most churches, the ladles’ associations of Morganston Church have always been its backbone. In 1907 the Ladies’ Aid was under the leadership of Mrs. John Morgan, one of the Morgans for whom the hamlet is named. The Ladles’ Aid became the Women’s Association in 1937 and then changed to the United Church Women in 1961. To put things in perspective: when the century was young and this church was opened, the Colborne Enterprise (predecessor of the Chronicle) was the community newspaper; pigs were worth seven cents a pound and a barrel of apples could be purchased for $1. The minister’s salary had recently been raised to $810 per year. Morganston United Church’s regular Sunday attendees have dwindled from over 100 down to only 12 to 14 per week. The church has an exceptionally beautiful interior. MAY 30, 1995: It’s like losing a beloved member of the family. 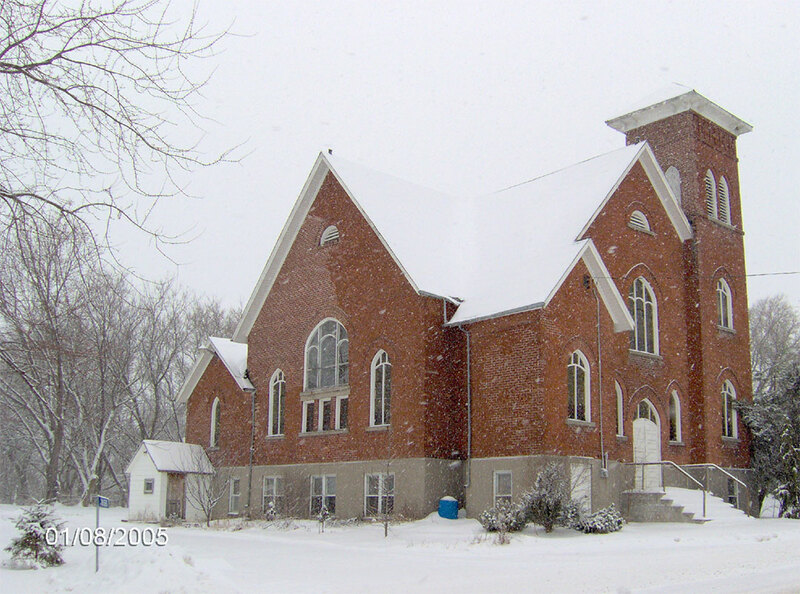 The few faithful members of Morganston United Church have regretfully, even tearfully decided that their church must be closed and probably demolished. A small group of about 10 met privately last Wednesday night in the church for what may prove to be the last time. The church was built in 1910 to serve a thriving population of mainly farming families. One of the first (and youngest) members of the congregation was Mr. McComb’s Aunt Sarah McComb who is now 91 and living in a retirement home in Brighton Township. “She was six when the Church had its first service” Mr. McComb noted sadly last week. Even five years ago, (in 1990) the church was attracting a large enough regular congregation for the members to install, at long last, running water and flush toilets. But, it’s all been downhill since then. Mrs. McComb says the average Sunday sees only about 12 to 14 people in the church that would easily seat 200. Both McCombs are elders in the church, and former Sunday school teachers. Mrs. McComb, a school teacher by profession, formerly served as Sunday school superintendent. Their sons. Bob and Dale, grew up in the church. In 1975, the Morganston congregation produced a history book entitled, “From Horses to Mopeds,” to tell the story of the Morganston Methodists from their earliest days, when circuit riders on horseback, or “saddlebag preachers” served congregations and individual families in homes in pioneer Ontario. In 1975, the church’s minister of the day, Rev. George H. Lavery, preferred to make his congregational visitations aboard a moped: hence the title of the history booklet. Mrs. McComb blames the church’s decline on natural population trends. “When the older people started to pass away, or move into nursing homes, no younger people came into the church to replace them.” Mr. McComb says there has not been as much new housing development around Morganston as in many parts of Cramahe because it is predominantly an agricultural area. “Residential uses and farm uses don’t go together very well,” he believes. “Farmers get up too early and work too late, and we smell,” he added, referring to spreading of fertilizer on fields. “This used to be a mainly United Church community,” explained Mrs. McComb. “There was only one family (of another faith) and they were Catholics, but they always supported whatever was going on at our church, even though they didn’t attend.” Today, she says, the area is inhabited by people of various, or no, church affiliations. For new residents of other denominations, it is easy to travel to Colborne or even Cobourg or Trenton, for a church service on a Sunday. That was not true In 1910 when the church was built, and even less so as far back as the 1830’s, when Morganston’s Methodist congregations met in schools and homes. The 10 who met last Wednesday in Morganston Church were “quite ready to discuss” moving to other churches, most likely to St. Paul’s in Warkworth or to Castleton United. The congregations of St. Paul’s and Morganston have agreed to amalgamate. They already share a minister. Dr. Bill Stephenson. The Morganston members who had to take the tough decisions are “very faithful ones to the church.” Mrs. McComb confirmed. Just as families find it difficult to dispose of the possessions of a departed loved one, the small congregation at Morganston is struggling to decide what to do with memorial gifts and accoutrements acquired by the congregation over more than 100 years. Some, like a cross and candlesticks given in memory of Mr. McComb grandparents, the late Marvin and Agnes McComb, will go to Castleton United Church where a new generation of McCombs attend. Others, like a framed woodcut of The Lord’s Prayer, at least 75 years old, has already been donated to St. Paul’s, which is part of the same pastoral charge as the Morganston Church. But then, there are things that can’t be placed so easily, like the curved quarter-cut carved, oaken pews and the numerous, beautiful stained-glass windows. But hopes are slim that another denomination will take over the building when attempts to fill the pews have been unsuccessful for the dominant denomination of the area. The congregation reached the regretful decision Wednesday to look into having the building demolished because, in the words of Marvin McComb. “We don’t want to see it fall down, and we can’t afford to keep it standing.” “And we don’t want to see it become a garbage dump,” his wife agreed. Initial approaches to the Belleville presbytery indicate that this overseeing body will not object to the demolition of the church, if it is what the congregation wants, said Mr. McComb. The best they feel they can hope for is that their church will live on in their hearts, and in the other churches where the congregation disperses. And, perhaps, as a bonus, some church somewhere that is being built new or remodelled, may take some of their finer fixtures from the old red brick building that has stood for 100 + years near the corner of County Road 25 and Morganston Road.